Today, we are going to learn some interesting mnemomic tricks using the celebrated Pythagorean Theorem from your young years at the school. 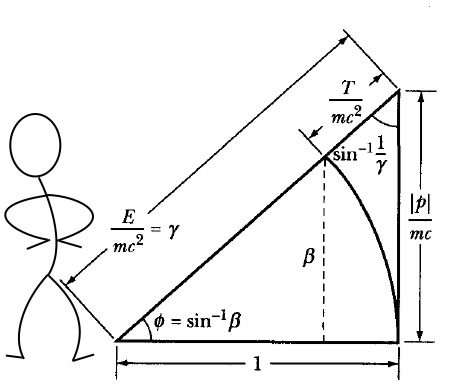 We will be using some simple triangles to remember some of the wonderful formulae of Special Relativity. It is quite nice and surprising that basic euclidean trigonometry tools are very helpful in the abstract realm of relativistic theories, a theory based on non-euclidean geometry! It is one of the great powers of Mathematics. Its amazing ability to model big things with simple pictures and equations. There is no other language like the mathematical language, and despite its terrible looking sometimes, it is awesome and beautiful most of the time. Of course, like it happens in Arts, mathematical beauty can be very subjective. So, you have to be trained in order to admire and love its great features. In summary, triangles are cool! Remark(I): The relationship is also called dispersion relation in SR. Some theories beyond the Standard Model of Particle Physics and/or “extended” relativies can modify this equation. However, any known experiment seems to be consistent with SR and this dispersion relationship as far as I know. This equation is of course the energy-mass general rule for any massive particle like neutrinos, massive fermions, massive gauge bosons, the Higgs particle, and so on. 1st) How momenergy transform under Lorent transformations, i.e., the Lorentz transformations of momenergy. 2nd) Some extra stuff on relativistic energy and other alternative deductions of some formulae we just derived in the last posts. PART(II): ADDITIONAL CALCULATIONS ABOUT RELATIVISTIC ENERGY. In conclusion, the rate of change of the kinetic energy of a body with respect to time, i.e., the power P it absorbs, is equal to the scalar product of the force and the velocity. This is a well known result from classical mechanics and special relativity does not change it at all, since the dot product is a good invariant. Now, we will study what happens in this type of collsions in the classical mechanics realm and in the SR framework. Conclusion: TOTAL (INERTIAL) MASS IS CONSERVED! Do you recognize this fact/law? Yes: Newton’s second law plus the no force condition provide the celebrated Lavoisier’s law of Chemistry (the conservation of mass) if we consider the transformation between different inertial frames in Classical Mechanics. Lavoisier’s law remained exact until the discovery of radioactive substances. 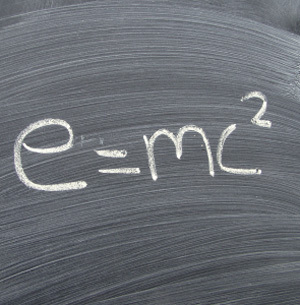 Special Relativity, thanks to the equivalence between mass and energy, could explain the mysterious origin of the radioactivity that Classical Mechanics could not understand. Remark: In the special case that the initial and final objects match, we get the conservation of the rest mass (a.k.a. Lavoisier’s law) as a trivial identity AND the commonly known kinetic conservation law. They are “emergent” from SR in certain limit. When we say that the initial and the final objects match, we mean that they are completely identical, i.e., a complete identity. 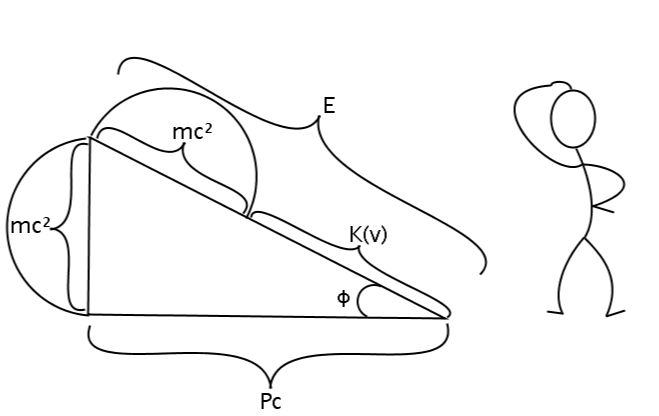 If, for instance, in the collision some body gets some heat (i.e., it increases its temperature) or if some body change its inner rotational state, or if some body is “excited”,…Or generally, if the inner energetic content “changes” in any of the colliding objects, the internal energy changes, therefore its inert mass too, and the collision is not elastic. 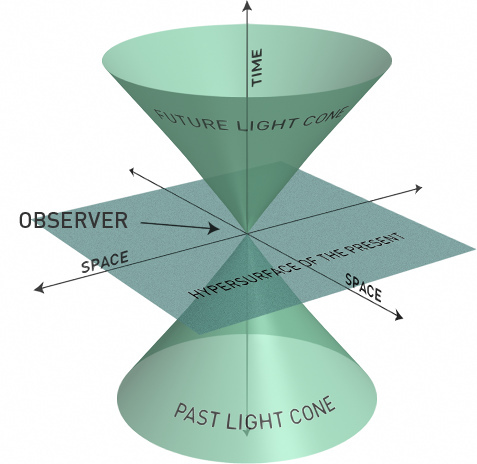 We have seen that space and time are merged into the spacetime in Special Relativity (SR). Morever, in a similar way, we have also deduced that momentum and energy are merged into an analogue concept: the momenergy. Now, we are going to understand better these concepts using basic undergraduate Physics, showing that everything we get from SR is consistent with newtonian physics and the whole theory as a whole. Therefore, the relativistic kinetic energy approaches the classical result in the limit of small velocities, as we expected, and the total relativistic energy agrees with the classical result, excepting a constant we called the rest energy and further corrections we neglect if . Nowadays, we have no clock with this precision, so the neutrino mass measurement using this approach is impossible with current technology. However, it is clear that if we could make clocks with that precision, we would measure the neutrino mass with this “time of flight” procedure. It is a challenge. We can not do that in these times (circa 2012), and thus we don’t measure any time delay in baseline experiments. Then, neutrinos move with and since there is no observed delay (beyond the OPERA result, already corrected), neutrinos are, thus, ultra-relativistic particles, and for them with great accuracy. Moreover, from supernova SN1987A we do observe a delay due to the fact that stellar models predict that neutrinos are emitted before the star explodes! 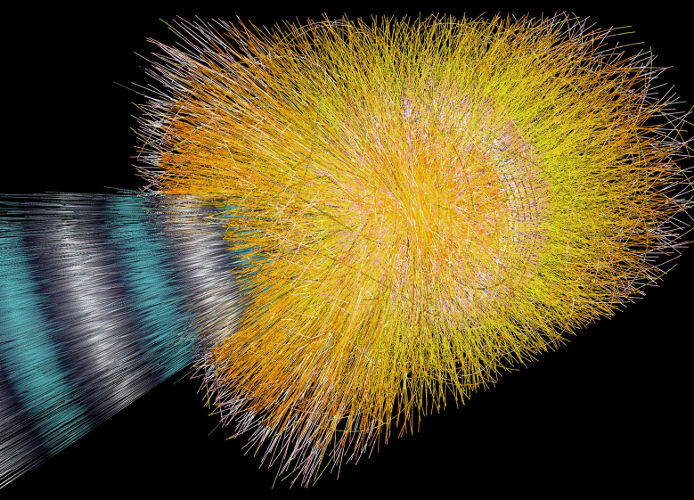 During the collapse, and without going deeper in technical details on the nuclear physics of dense matter, neutrinos scape almost instantaneously (in about some seconds) from the collapsing star but the photons find theirselves blocked during some hours due to the pressure of the dense matter. After some time passes, the block-out ends and photons are released. Historically, this picture was not the physical portrait of collapsing stars around the eighties of the past century, and the observations of supernovae entered, crucially, into scene in order to solve the puzzle of why neutrinos arrived before the photons (indeed, superluminal neutrinos were already tried and postulated to solve that paradox). However, SN1987A was helpful and useful due to the insight it offered about the nontrivial subject of collapsing stars and dense nuclear matter. Before SN1987A there were some assumptions about the nuclear processes inside collapsing stars that proved to be wrong after SN1987A. The puzzle was solved soon with the aid of SN1987A data taken by experimental set-ups like (Super)Kamiokande, and the interaction and collaboration between nuclear physicists, astrophysicists and high energy physicists. Generally speaking, that was the path towards the currently accepted models of nuclear physics in the inner shells of exploding stars. In summary, photons find a several hours long block-out due to the dense collapsing material from some inner shells of the star, while neutrinos come out, and when the block-out ends, photons are shot into the sky (Bang! A supernova is born). The delayed time is consistent with the above expressions. The neutrinos arrive before the photons not because they are faster but due to the fact they are emitted before and they don’t find any resistence unlike photons; light is blocked by some time due the nuclear conditions of the matter inside the imploding star, but it ends after some hours. Furthermore, since neutrinos travel almost at speed of light, light generally is not able to reach them, even at astrophysical distances! Obviously, it is an analogue of the previous formula Q. Q’ provides a measure of how much the propagation velocity of neutrinos differs from the speed of light. Experiments are consistent with a null result (the difference in velocity is measured to be zero). In conclusion, the neutrinos move almost at speed of light (with current experiments not being able to distinguish the tiny difference between both velocities, that of neutrino and the speed of light). Then, all the mathematical equations match. We are going to develop the mathematical framework of vectors in (Minkowski) spacetime. 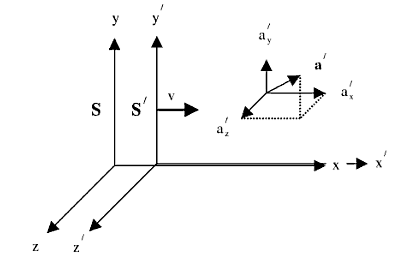 Vectors are familiar oriented lines in 3d calculus courses. However, mathematically are a more general abstract entity: you can add, substract and multiply vectors by some number. We will focus here on the 4D world of usual SR, but the discussion can be generalized to any other D-dimensional spacetime. I have included a picture of a vector OQ above these lines. It is a nice object, isn’t it? Wonderful! 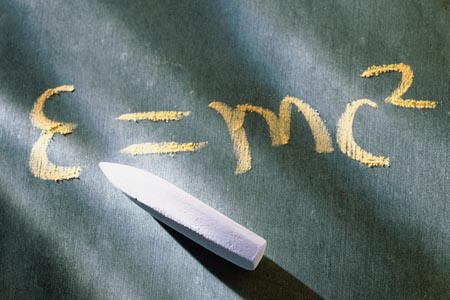 Momenergy allows us to unify the concepts of mass, momentum and energy in a 4D spacetime world! i.e. linear accelerations have proper acceleration . In the case of circular motions, where , we get proper acceleration . Thus, the centripetal proper acceleration, e.g. in a storage ring, is . Recall the previously studied spacetime and momenergy vectors. Here, it is often defined the transversal mass as (mass-like coefficient for force perpendicular to the motion) and also the so-called longitudinal mass (mass-like term for the force parallel to the direction of motion). The non-trivial expression for the spacetime acceleration and the mathematical consistency of the theory do the rest of the work for us. Remark: Some books and authors define the D’Alembertian as . While that notation is indeed valid/possible, and despite it can safe time sometimes, it is obviously a tricky and non-intuitive, somewhat unlucky, notation. We warn you about it, and we highly recommend transparent and powerful notations like the one introduced here, keeping in mind the physical concepts behind all this framework. The easiest ( the most studied so far) case with a higher dimensional spacetime is that of signature , the SR case, or its most natural generalization with signature . When Michelson did his first experiment in 1881, he had got and , and thus the expected fringe shift provided the minimum . The shift was not observed, and performing some improvements, Michelson and his collaborator Morley, in 1887, got and achieved a better ressolution in the fringe shift pattern. But, surprinsingly, there was no fringe shift in both cases! In 1892, George Fitzgerald and H. Lorentz proposed (before A. Einstein true explanation with his relativity) that objects in the aether were contracted in the same fashion (with the same formula) than we saw in relativity. In their conception, they indeed derived the Lorentz (or Lorentz-Fitzgerald) transformations but they intepreted (wrongly) in the context ot the electromagnetic ether theory. In this way, bodies were contrated in their motion through the aether and it could explain the null result of the Michelson-Morley experiment and other similar experiments. It changed radically when Einstein published his articles on relativity with the correct physical insight and consequences of their transformations, that Einstein himself derived from two simple principles, and more remarkably, neglecting the own existence of the ether! 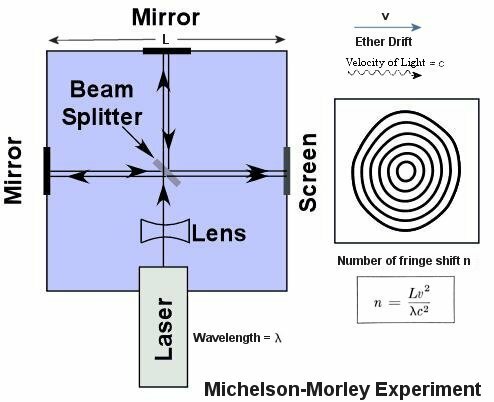 The Michelson-Morley is likely one of the null experiments most famous in the history of Physics. Indeed, it advanced the rising of the special theory of relativity and, in perspective, it was saying that the ether hypothesis was not necessary for the electromagnetic field and its waves to exist and propagate “in vacuum”. Of course, from the modern viewpoint, relativity moved the question of the ether into another…Nobody questions today how can light travel at speed of light in vaccum always at the same speed, independly from the source. Nobody questions that light can self-sustain their own oscillations in vacuum in space and time everywhere in the known Universe. Simply, we do know that it can and it does…Light and vacuum are entangled somehow. Indeed, the questions about the nature and properties of the ether has shifted now into the question what the vacuum is...That is, now we ask about what are the properties and nature of the vacuum and its properties. But that is another story that advanced the rising of the theory and methods of Quantum Physics and Quantum Field Theory. Too far for this modest post today! Every result of Michelson-Morley type experiments has been null. The ether as the 19th century physicists imagined does not exist. QUESTION: What is the acceleration in the S-frame? where to obtain the second table we used the usual trick to map primed variables to unprimed variables and to map into . One important comment is necessary in order to understand the above transformations. One could argue that the mathematical description of accelerated motions is beyond the scope of the special theory of relativity since it is a theory of inertial reference frames. THAT IDEA IS WRONG! Special Relativity (SR) IS based rather on the concept that every reference frame used for the calculations IS an inertial reference frame. It has NOTHING TO DO with accelerations between frames, and as we have showed you here, they can be calculated in the framework of SR! In conclusion: the description of accelerated motions relative to inertial reference frames makes sense in SR and IS NOT subject to any limitation (unless, of course, you change/modify/extend the basic ideas and/or postulates of SR). In our daily experience, we live in a “non-relativistic” world with a very high degree of accuracy. 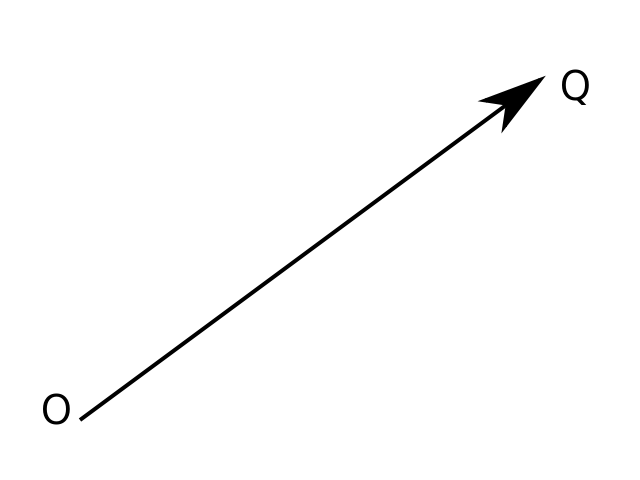 Thus, if you see a train departing from you ( you are at rest relative to it) with speed (in the positive direction of the x-axis), you move with relative velocity respect to the train if you run in pursuit of it with speed , or maybe you can also run with relative speed if you run away from it in the opposite direction of motion. However, light behaviour is diferent to material bodies. Light, a.k.a. electromagnetic waves, is weird. I hope you have realized it from previous posts. We will see what happen with an SR analogue gedanken experiment of the previously mentioned “non-relativistic” train(S’-frame)-track(S-frame) experiment and that we have seen lot of times in our ordinary experience. We will discover that velocities close to the speed of light add in a different way, but we recover the classical result ( like the above) in the limit of low velocities ( or equivalently, in the limit ). CAUTION ( important note): v is constant (a relative velocity from one frame into another). 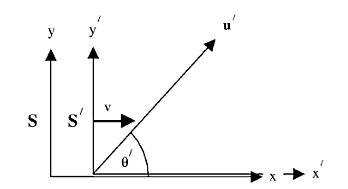 u is not constant, since it is a vector describing the motion of a particle in some frame. Therefore, the transverse velocity also changes in that way! There is an alternative deduction of the above formula using space and time coordinates. We will proceed in two important cases only. Indeed, these two cases are particular cases of the general transformations we got before. 1st. For low velocities, i.e., if and/or , the result approaches the nonrelativistic “ordinary life” experience: . 2nd. For positive velocities and a positive relative velocity between frames , the addition of velocities is generally , i.e., we get a velocity smaller that in the non-relativistic (ordinary or “common” experience) limit. Then, the deviation with respect to the non-relativistic value ( 60km/s) is negligible for all the practical purposes! This typical velocity, 30km/s, is about the typical velocities in 20th and early 21st century space flight. So, our astronauts can not note/observe relativistic effects. The addition theorem in SR is not practical in current space travel (20th/early 21st century). Thus, we observe that a higher velocities, e.g., those in particle accelerators, some processes in the Universe, etc, the relativistic effects of the non-linear addition of velocities can NOT be neglected. The effect is important and becomes increasingly important when the velocity increases itself ( you can note how large the SR effect is if you compare the 0.25c and 0.5c examples above). and . Therefore, if a trian is travelling at the speed of light, and inside the train an object is thrown forward at c, we DO NOT observe/measure a 2c velocity, we observe/measure it has velocity !!!! if we stand at rest on the track. Amazing! Therefore, if the train travels at c, an inside of the train an object is launched at right angles to the direction of motion at the velocity c, the object itself is measured/seen to have velocity c measured from a rest observer placed beside the tracks. Amazing, surprise again! Even if the inertial frames move at superluminal velocities relative to each other, a light beam would remain c in the S-frame if SR holds! Surprise, again! If SR holds, the velocity (or speed) of light is the maximum speed attainable in the Universe. You can like it or hate it, but if SR is true, you can not avoid this conclusion. It is logical. In the nonrelativistic limit we do know that and , so the result agrees with our experience in the low velocity realm.